Below are copies of notices sent out with monthly statements to transfer station customers. December 1, 2016 - Notice of $0.95/ton tipping fee increase to $95.45/ton for all waste types beginning January 1, 2017. The holiday schedule for the remainder of 2016 as well as 2017 is provided. Also is information about saftey clothing to be worn while using the transfer stations, especially properly colored safety vests. Finally, a reminder that certain materials are mandated to be source separated and recycl;ed by the waste geenrator and therefore, the specified materials are not accepted for disposal at the transfer station. May 27, 2015 - Notice of $1.06/ton tipping fee decrease to $94.50/ton for all waste types beginning June 1, 2015. Note: this is a correction to the May 12, 2015 notice below where the MCMUA in advertently stated the the tipping would decrease to to be $94.00/ton as opposed to $94.50/ton. May 12, 2015 - Notice of tipping fee decrease for all waste types beginning June 1, 2015 (note that there was an error in the price decrease listed here which was revised in the May 27, 2015 notice) ; remaining transfer station holiday schedule for 2015; reminder about mandated recycling in Morris County; reminder that mandated source-separation recycling applies to construction and demolition projects; safety message regarding the need for all passengers remaining in vehicles while using the transfer stations; safety and operations rules for the transfer stations that the MCMUA request customers read and sign indicating they read the rules. February 8, 2011 - Announcing availability two new decals appropriate haulers to place on dumpsters and roll-off containers that say, "Recyclable Not Allowed in Garbage" and "Hazardous Waste Not Allowed in Garbage." Additionally, the newsletter reminds people about mandated recycling in Morris County and electronics and hazardous waste management in 2011. December 8, 2010 - Notice of tipping fee increase to $94/ton for most waste types; electronics recycling evolves and disposal ban on TVs, computers, laptops and monitors starting in 2011;transfer station holiday schedule for 2011; waste to be enforce reminder. October 12, 2010 - Reminder to fill out the O&D (origin and destination) form correctly when town names are similar (Morristown vs. Morris Township vs. Morris Plains); reminder that all waste to be disposed of that is generated in Morris County must come to the transfer stations; notice of Unwanted Medicine Take Back Program Conducted On November 13, 2010; materials mandated to be source separated and recycled; remaining holiday schedule for 2010. July 14, 2010 - Clarifying differences between commercial haulers, limited/exempt haulers and homeowners hauling their own waste; need to maintain minimum balance in accounts; NJDEP's Licensing and Registration's new web-based computer payment system; holiday schedule; safety requirements to use the transfer stations; materials mandated to be source separated and recycled; 2010 household hazardous waste days remaining; pool chemicals can cause fires; closing stagnant accounts; insurance requirements; Habitat For Humanity Restore in Mine Hill; new dry-cell battery management techniques. June 4, 2009 - Insurance limits revised (general aggregate liability insurance limit is lowered to $2 million from $3 million). All other requirements remain the same. In addition, there are articles on 2009 Household Hazardous Waste Days, reminder that source separation of designated recyclables is mandated, pool chemical safety information, holiday schedule for the rest of 2009 and finally, a reminder to fill out the O&D (origin and destination) form correctly when town names are similar (Boonton vs. Boonton Township). February 10, 2009 - Household Hazardous Waste Day event announcements for 2009, holiday schedule for 2009 for the MCMUA transfer stations and offices, reminder about the mandate to source separate and recycle designated materials and to inform generators/customers of such requirements. January 7, 2009 - Reminder to tarp your truck to prevent litter; Morris Habitat for Humanity ReStore, located on Iron Mountain Road in Mine Hill provides a green alternative to the disposal of a variety of materials. September 10, 2008- Morris Habitat for Humanity ReStore, located on Iron Mountain Road in Mine Hill provides a green alternative to the disposal of a variety of materials; with respect to insurance requirements, the "additional insured" statement on insurance certificates needs to include the MCMUA as additionally insured. August 12, 2008 - Insurance needs to be up-to-date, pool chemical safety, remaining hazardous waste disposal days for 2008, mandated source separation recycling with a focus on metal appliances, designated the proper township vs. borough when they share the same name i.e. Chatham Township vs. Chatham Borough. 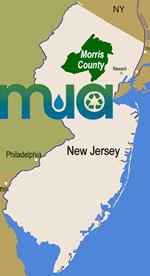 May 5, 2008 - Notice of revised insurance requirements with revised insurance certificates to be sent to MCMUA by June 1, 2008, new NJDEP recycling penalties for generators to be enforced and, household hazardous waste schedule for 2008. April 2, 2008 - Additional information on the $3.00/ton recycling tax, notification that revised insurance requirements will be issued shortly and, provision of the 2008 holiday schedule for the MCMUA transfer stations and offices. March 4, 2008 - reminder of $3.00/ton recycling tax, getting the waste origin correct on the O&D and advising that Health Department may be issuing fines for disposing of mandated recyclables.